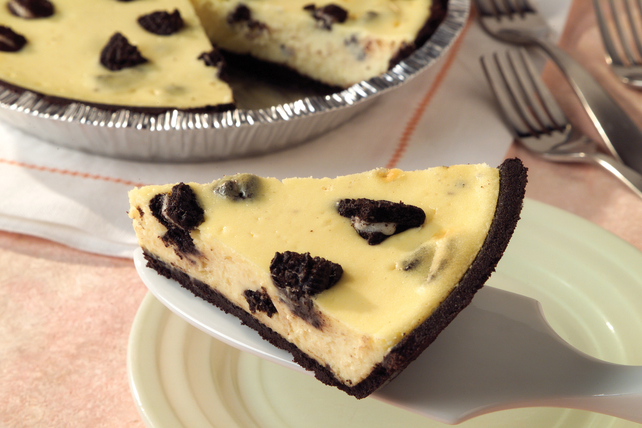 Take a shortcut to cheesecake heaven with our Philly 3-Step Cookies'n Cream Cheesecake. We've used a prepared crust to cut down on prep. MIX cream cheese and sugar with mixer until smooth. Add eggs, one at a time and mix until just blended. POUR half the batter into crumb crust; sprinkle cookie pieces over top. Pour on remaining batter. BAKE at 350°F (180°C) for 30 minutes or until centre is almost set. Cool to room temperature. Refrigerate 3 hours or overnight. Top with whipped topping and additional cookie pieces, if desired.